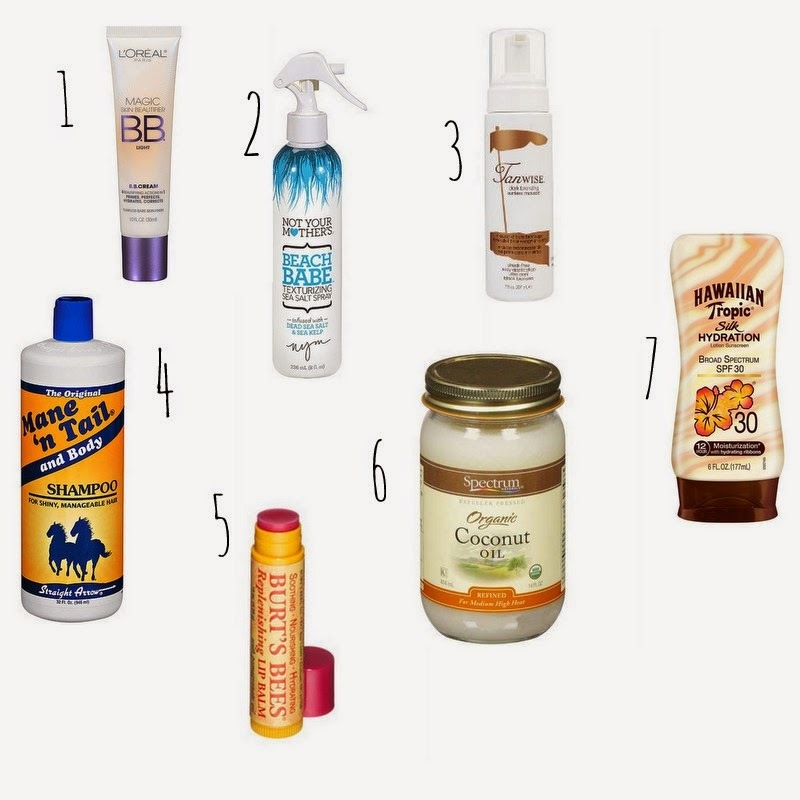 My "summer routine" doesn't change a whole lot, but there are certain products that I just LOVE using in the summer! 1. Loreal BB Cream. I use this year round, and absolutely love it. I love how light it is, and my skin doesn't get greasy or dry, it's absolutely perfect! I wear the shade "light", and I wear that all year. I feel like I can change up the shade when it gets to summer with not wearing as much if I have a good tan, or just by wearing bronzer. 2. Not Your Mother's Beach Babe Texturing Sea Salt Spray. I rarely do my hair in the summer, because I can get away with some beach waves. Not only does this help the "beachy look", but it smells like a dang ocean water drink from Sonic. It reminds me of summer and the beach, and sometimes I wear it just for texture, and to well, smell my hair all day! NOTE: I've only ever found this at Walmart. My Target doesn't carry the whole line. 3.Tanwise Dark Bronzing Sunless Mousse. I read about this on Cara's blog, Maskcara, and since then I've wanted to try it. I loved it, and it didn't have a bad after-smell like most do. I ended up using an old sock to apply since I didn't buy the mit, and it worked great. I had to have Tanner help with my back, but the application process was super easy! I treated it like a spray tan, and applied it at night, then showered in the morning. It stayed for a couple days, especially on my face, and it's great for a work-inside-all day girl! 4. Mane N' Tail Shampoo. My friend informed me that she started using this, and she saw a change in her hair. Ever since I stupidly cut my hair when we first got married, I've had trouble with it growing back in the same texture, and thickness. This doesn't have a great smell, but I feel like I'm getting thicker horse hair- Even if it's all in my head! :) We'll see how it keeps working. And, score.. it's a HUGE bottle for super cheap. 5. Pomegranate Burt's Bees. This has been my favorite for a really long time. I recently found it in an old purse, and it made me so happy because I've missed it! It's so much smoother than normal Burt's Bees, and I love that it has a perfect tint for your lips. I wish it had some SPF in it, but I think I'll live! 6.Organic Coconut Oil. Not only do I use this a lot when cooking, but last night I slept with it in my hair! I just applied it to my ends and pieces that have felt dry, and slept in a top knot. After my blow dry this morning (if you know me, you know that's a big deal) (AND I can, because we have AC!) I noticed a difference! They felt SO much smoother, and styled better. I also applied it to my face as a moisturizer, and my face felt so smooth, and my makeup applied so great. I'm going to experiment, and start putting it on my face more often! It's weird using an oil, but I've heard great things! 7. Hawaiian Tropic Sunscreen. Shelley has this, and I love "forgetting" my sunscreen at the pool and using it! It smells like a wonderful vacation in a bottle, and I like the way it makes my skin feel even when I jump out of chlorine.